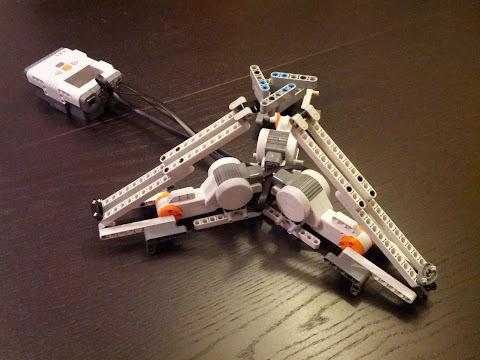 A delta robot is a robot with three motors placed on a triangular base, connected to a smaller triangular platform through three arms (the second platform is called the end effector, because it's the part that actually does stuff). The arms have universal joints in them and work as parallelograms. Because of that, the end effector's movement is restricted to just X,Y,Z translations, it doesn't rotate and stays parallel to the base. Because of their speed and precision, delta robots are widely used in the packaging industry and other places. They're also the kind of thing that you look at and immediately think hey, I bet I could recreate that with Lego Mindstorms! To make the robot work, we have to take the desired position of the end effector and translate it to angles to which the three arms must be rotated by the motors (fancy term for that is inverse kinematics). It involves some geometry, but luckily for us a man named Maxim Zavatsky worked it all out and posted a nice tutorial here. The program that controls my robot (which you can see here) is mostly a copy & paste of his code. When making this robot, I found out that even though the NXT motors have encoders that tell you their rotations with degree accuracy, it's not very easy to precisely reach a certain angle on the motor. Setting up a gear reduction would help with the precision, but the Mindstorms set doesn't come with enough gears for three arms. I ended up using absolute position regulation from the enhanced NBC/NXC firmware (PosRegEnable() and PosRegSetAngle() functions). Since the PosRegSetAngle() call is non-blocking (it returns immediately and the position regulation happens in the background), it would be good to have a way of knowing when the motor has reached its set point. One solution that comes to mind is to keep watching the motor's position and when it stops changing assume that it is as close to the desired angle as it's going to get. Right now I'm using hard-coded Wait() calls, which is obviously not optimal. My robot doesn't actually do anything (except move), but it would be interesting to attach a pen to it and make it into a drawbot. For that I'd have to somehow mount it upside down and probably work on making it a little stiffer (right now it's pretty wobbly). Another thing to try would be to reverse the calculations and turn the robot into a 3D input device (you would move the end effector by hand, read the angles from the motors, translate those into X,Y,Z and send the data to a computer). Here's an album with some pictures of the robot. Thanks for the links - very helpful!